View More In Cocktail Shakers. Premium Entertaining Handcrafted and polished 100% Pure Copper Shaker Set with copper-plate bar tools. All the tools needed to craft an exceptional cocktail. Each Set is an artisans work of art and sure to elevate your entertaining experience. 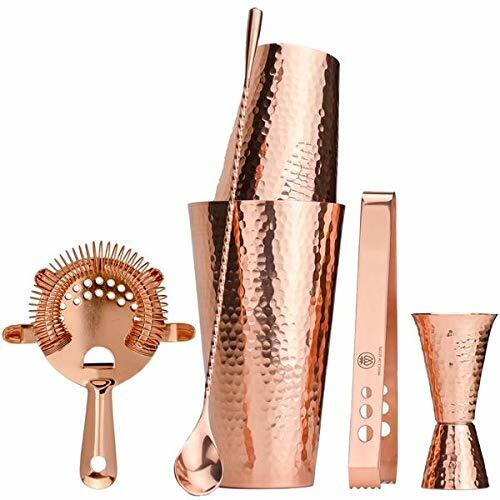 The Kit includes a Classic Style Boston 2 Cup Shaker, and A fluted copper double-side jigger, strainer, ice tongs, and tear-drop spoon. THE JIGGER: The Smaller Jigger 1 Once with 1/2 ounce measurement marks. The 2 ounce side has 3/4 and 1 1/2 ounce marks for measurement. Made of Pure Copper. THE BAR TOOLS: Copper Plated Stainless Steel Strainer, Ice Tongs, and Tear Drop Spoon. Perfect for elegant entertaining. Hand Wash. Lacquer coating to prevent tarnishing. If you have any questions about this product by Prince of Scots, contact us by completing and submitting the form below. If you are looking for a specif part number, please include it with your message.